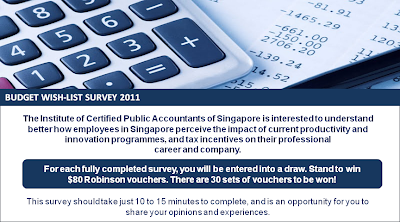 The Institute of Certified Public Accountants of Singapore is interested to understand better how employees in Singapore perceive the impact of current productivity and innovation programmes, and tax incentives on their professional career and company. Stand to win $80 Robinson vouchers. There are 30 sets of vouchers to be won!